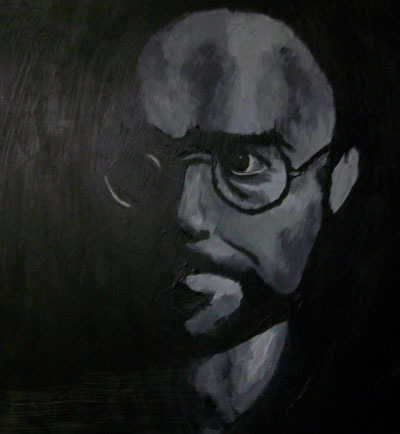 This is an acrylic painting of Robert Fripp based on the album cover of Red by King Crimson. I submitted this painting to the UMF art gallery at the end of my fall semester, and found out only when the painting had been taken off display that it was hanging in the first place. Too bad I couldn't post a picture of it on display! It's funny to me how expressionless he always looks, while his music is so riveting and full of expression! I suppose it adds to the mystery that is Fripp, great painting!